LONDON, Nov 17: International athletics officials are poised to tell South African Caster Semenya whether she can continue to compete – as she did at the world championships in August – following the gender controversy. By Friday, at the latest, the International Association of Athletics Federations will have taken all the necessary legal advice it needs before making a formal statement about the 18-year-old’s future. Semenya, who won 800m gold at the World Championships in Berlin in August, could be suspended, told to have surgery or cleared to run as a woman. 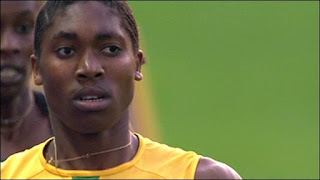 Speculation began after Semenya ran 1min 56.72sec in July - smashing her previous personal best by more than seven seconds – that she had an intersex status. She also broke Zola Budd's long-standing South African 800m record before arriving in Berlin as new African junior champion. In Berlin she won by 2.5 seconds from 2007 champion Janeth Jepkosgei in 1.55.45, the fastest time of the year. Before the race, it leaked out that the IAAF demanded Semenya take a gender test. The IAAF asked South Africa to withdraw her from their team for Germany but Athletics South Africa (ASA) insisted she should run and has since said it is certain she is female, a claim backed up by her family. Earlier this month, South Africa's Olympic governing body suspended ASA president Leonard Chuene after he admitted that he lied about whether Semenya had been gender tested before Berlin. The ASA board and its members have also been suspended pending a disciplinary investigation into the matter.